Stragglers had all arrived by around nine to the carefully chosen soundtracks of their various journeys - volunteers assembled, coffee was desperately sought, boats were rigged and anticipation built as breakfast was eaten in a mess of a hurry before everyone descended on the changing rooms; the boys were jealous of the girls, who have taken over both changing rooms leaving them with a tent. Everyone was impressed by the marquees and refreshment vans - “…should’ve held the 2012 Olympics here,” was a sentiment overheard, funnily enough, from Southampton Green. All teams rushed to choose the bibs with the letter of their university – sadly there aren’t enough L’s in the alphabet, and Loughborough beat London to it. Slowly the mist that’d been sitting over the lake rose as the first races began. Nobody had any clear favourites to win, but everyone was buzzing and keen to begin, and contrary weather reports from different teams predicted wind building or dying throughout the day, so there was everything yet to unfold. Races were on track and worked through steadily, and the start boats and Umpires saw few collisions or protests – racing was exciting, but all teams were courteous. Everyone wanted a go at piloting the drone being controlled from the pontoon, taking photos and footage of all the racing. Mid-afternoon saw Edinburgh Blue leading the tables, with Cambridge Blue currently in second place. Edinburgh were pretty chuffed even though they’d just lost their first race by the time their photograph as, table-toppers, was taken, posed on top of a table, of course, “stable at the top of the table, Mabel,” was the motto as they fell off their bench and returned to the boats to carry on. “We feel at home because it’s raining now!”. Wind slowed throughout the day, but sailors didn’t; pace kept up and tables keep changing – a fair few teams got a chance to be in the top five, Cambridge Blue overtake Edinburgh briefly at the top of the rankings, who dropped and then climbed back up again, both with six wins by the time racing was called to stop at 112. 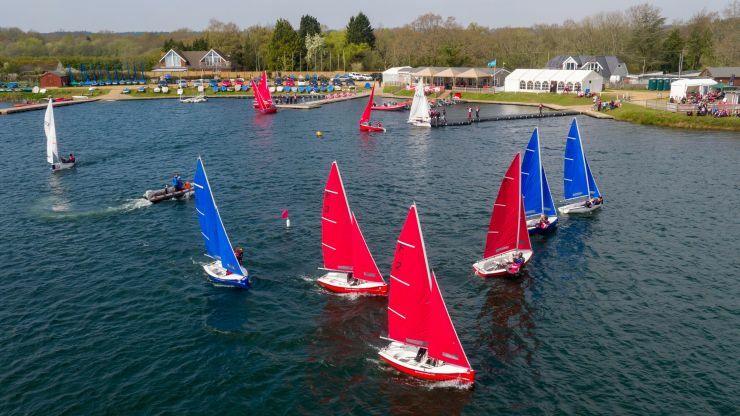 For full and up-to-date results, please consult the KSail website - http://events.ksail.co.uk/2019/BUSAFinals/RaceResults.html. Everyone is still eager as races come to a stop. Nottingham says not being at the top could just be an ‘element of surprise tactic’ and tomorrow they’ll stun everyone, and Bath Black have two win, but are pleased to be here and sum up the feeling “We’re not winning, but we love the sailing – don’t let that be the only quote you get from us.” Everything still to come after Day 1, as “Awesome stuff today, everyone….” crackled over walkie talkies across the water and the last boats returned to the shore. One alumni secretary, reporting to his members worldwide, summed up: “Slick organisation and moderate winds, though they declined during the day, made for an excellent opening of the BUSA 2019 Team Racing Championships”.